With demand for Russian gas outside the CIS increasing dramatically over the last week, analysts speculate that supplies are being stockpiled in case Russia cuts off the gas. Since March 1, the supply of Russian gas outside the former Soviet Union has increased by 8 percent, reaching 476.5 million cubic meters per day. The extraction of imported gas by Naftogaz Ukraine alone has doubled to reach 45 million cubic meters per day. According to Konstantin Simonov, an analyst and general director of the National Energy Security Fund, the increase is likely due to fears of another gas war. “Europeans understand what all this might result in,” Simonov said. He speculates that Europeans are probably pumping an increasing amount of gas into underground storage facilities to prepare for a possible cut-off of gas supplies via Ukraine. Mikhail Korchemkin, head of the consulting company East European Gas Analysis, added that Kyiv is also preparing for complete loss of Russian gas. There are several scenarios that could lead to a gas war. Russia could refuse to supply gas to Ukraine because of non-payment or because Ukraine is not taking as much gas a required under the current contract. 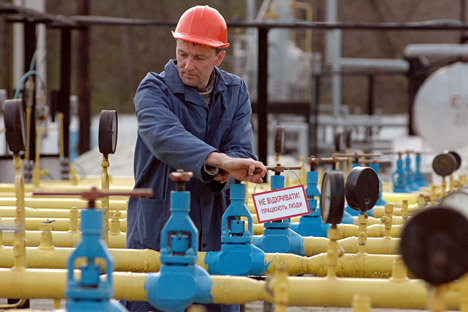 Ukraine could refuse to buy gas at the suggested new price of $400 per thousand cubic meters. Or, a pipeline could be destroyed as the result of sabotage or armed conflict. For the moment, however, experts do not expect that gas supplies to Ukraine will be stopped because such a move would be detrimental to Russia. It could result in a loss to Russian gas monopoly Gazprom of a third of its export earnings, or $10 billion, according to Korchemkin. He added that Gazprom would be particularly reluctant to take such a step while Western capitals are threatening economic sanctions. “U.S. financial sanctions will make it more difficult to get bank loans for Russian state-owned companies, and Gazprom simply will have no money for the construction of the South Stream,” Korchemkin said. However, Ukraine is not the only transit path for Russian gas. Gas also flows under the Baltic Sea via the Nord Stream pipeline. If Ukrainian transit is stopped and the Nord Stream is loaded fully, Europe will receive about two-thirds of the contracted volumes, according to Korchemkin. Under this scenario, interruptions in the gas supply would affect only Slovakia, and regardless, European countries still have substantial gas supplies in underground storage facilities and on the spot market. Korchemkin thinks that unless the Ukrainian pipeline is blown up, there is no real threat of a gas war until next winter. Nevertheless, according to Simonov, a gas war could take place now because of the need to pump gas into underground storage facilities in preparation for next winter. While Russian gas is formally transmitted to Europe via Ukrainian pipelines, in reality, Ukraine supplies gas from its storage facilities, because they are located near the European borders. The transit gas, which goes from Russia to Europe, is extracted by Ukraine for itself. Therefore, if Ukraine has not pumped enough gas into its underground gas storage facilities, there will be a threat to the transit of gas to Europe and Ukraine will fail to perform its obligations as a transit country. In this case, Ukraine itself will not lack gas because Kiev will continue to extract gas from the pipeline on the border with the Russian Federation. “Gas should be pumped into storage facilities starting from late summer. I am afraid that the new authorities [in Kyiv] have not taken this issue into account at all, so we can predict a serious gas crisis in the fall,” Simonov said. Alexei Skopin, the head of the Department of Regional Economics at Higher School of Economics in Moscow, said that the gas war could have some benefits for Russia's gas exports. "If Crimea separates, Russia will have to negotiate about the South Stream and other projects directly with the Crimea, and I think it will be much easier to negotiate. The project can get normal conditions for implementation and it does not require huge investments. It only needs investment from the countries that own the pipe," Skopin said. This text has been abridged from the original, which can be read at Vzglad.